[upper inset]: Henry Holiday’s depiction of the Billiard marker in Lewis Carroll’s The Hunting of the Snark (1876). [lower inset]: The comparison shows Henry Holiday’s first depiction (draft) of the Billiard marker in Lewis Carroll’s The Hunting of the Snark. The face on the right side is Henry George Liddell’s face at a younger age. Here both noses look quite similar. I think that in his first draft, Henry Holiday alluded to the image of the young Liddell quite clearly when he created his depiction of the Billiard marker. However, as Liddell was the boss of C. L. Dodgson (aka Lewis Carroll), I could imagine that in the view of Dodgson, the similarity was too clear. 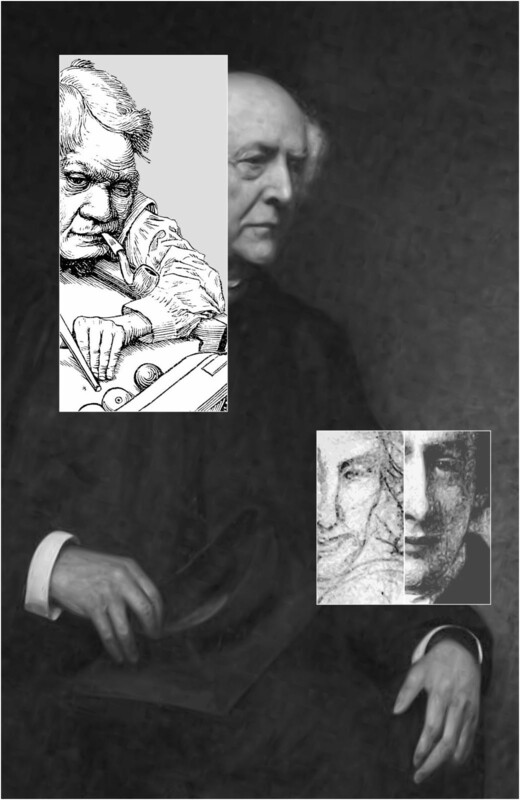 Thus, the final depiction of the Billiard marker was ambiguous enough not to get Dodgson/Carroll into trouble.